On 1 January 1511, in the very first hours of the morning, Catherine Of Aragon, wife of King Henry VIII, gave birth to a baby boy. Finally, England had an heir! His parents were overjoyed. The baby was called Henry, like his father and grandfather, and duly baptized four days later at the Chapel of the Observant Friars at Richmond. 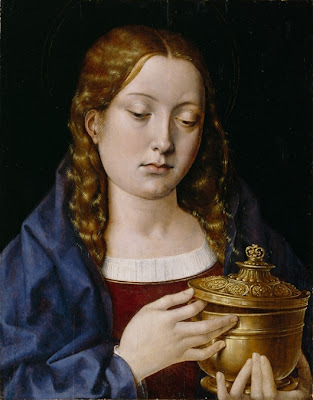 King Louis XII of France, who sent a golden cup and salt as gifts for the royal baby, and William Warham, Archbishop of Canterbury, were chosen to be his godfathers; his godmother was Margaret of Austria. The baby, known as The New Year’s Boy”, was also soon made Duke Of Cornwall. The prince’s birth was celebrated with a tournament in his mother’s honour held at Westminster. The Queen was present, enjoying the spectacle with her ladies-in-waiting. The King and his knights jousted. The King had the words “Cure loial” (loyal heart), embroidered on his shirt, a profession of love and devotion to the Queen; his cousin Edward Neville was Valiant Desire; William, Count of Devonshire was Bon Voloire (good will); while Thomas Knyvet was Joyeux Penser (happy thoughts). Henry ran 25 courses and won a lot of fights, but it was Valiant Desire, aka Edward Neville, who won the tournament. The tournament was followed by a banquet, held in the White Hall of Westminster Palace, which got out of hand. The crowd got rowdy and even attempted to strip the King. Luckily, Henry was in a very good mood and just laughed it off. After his death, Catherine tried to give Henry a healthy son, but all her pregnancies ended either in childbirth or miscarriage. She was, however, able to give birth to a healthy daughter, Mary I. But a girl wasn’t good enough for Henry. He would later move heaven and earth to divorce Catherine so that he could remarry and have a son. How differently things would have turned out if only “little Prince Hal” had lived!